There has been a serious terrorist attack in the south of Israel, north of Eilat. At least 40 injured, some critically. 7 dead. Civilian buses and cars were fired upon by at least 20 terrorists armed with various weapons, including RPGs, and IDF forces were attacked when they arrived to assist. Apparently the terrorists originated in Gaza, and crossed into Israel via the porous Egyptian border. IDF and security forces have engaged the terrorists, but at this time it’s possible that some have still not been caught. Live updates can be found at Israel Matzav, The Muqata, Challah Hu Akbar, and Israellycool. The IDF has said that they don’t think Hamas is directly responsible. The IAF has already struck targets belonging to the ‘Popular Resistance Committees‘ (PRC, a Hizballah-linked group) in Gaza, killing 6 including two of its leaders. The shooting is still going on. The Muqata reports that an Israeli was seriously wounded 300 meters from a press conference held by Ehud Barak, by shots fired from across the Egyptian border! For more than 30 years the Egyptian government ensured peace along the desolate border between the two countries. In the post-Mubarak phase–as I warned back in February–the successor regime is not so committed to the Egypt-Israel peace. 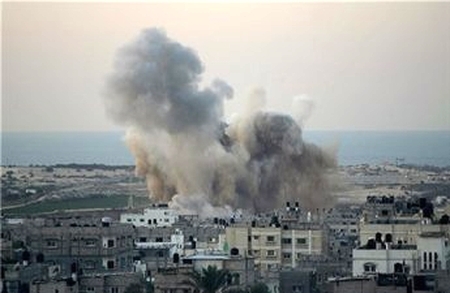 Military discipline has slackened and terrorist groups are increasingly operating in the Sinai penninsula. The natural gas pipeline to Israel is bombed every time it is put back into operation. A current Egyptian operation is intended to clear out terrorists affiliated with al-Qaida, from north Sinai. But while the media will no doubt attribute this attack to al-Qaida groups–and that might be accurate–this is far from the only problem. Hamas would no doubt cooperate with cross-border attacks on Israel from Egypt, as would the powerful Muslim Brotherhood which might well provide 30 to 40 percent of the members in the next parliament. One should also remember the old strategy of the PLO in the late 1960s and in the 1970s: create waves of attacks on Israel’s borders, provoking Israeli retaliation and mass enthusiasm for war with Israel; then push Arab states into the war for what is hoped to be a full-scale showdown. Have no doubt. This is not just an isolated incident but the opening of a new phase. It will get worse. At a minimum, Israel will have to devote a lot more of its limited resources to guarding the Egypt-Israel border. An important question is how decisively will the Egyptian military react and how supportive of the attack will be Egyptian public opinion. Given U.S. policy, nothing can be expected from Washington except words of dismay. The Egyptian regime will assure everyone that it is committed to the peace treaty and will take strong action. But what will happen when the military hands over power to a parliament with an Islamist-far left majority in a few months? Anyone want to hand over Israel’s West Bank border to sovereign Palestinian control? Just another incident, today very painful, but it will soon become just a dull ache as it joins the string of murders and pogroms against the Jewish presence in the Land of Israel going back at least 100 years. Except for the families of the victims, of course. I am thinking that this will stop only when outside support for the vicious creatures that commit these atrocities ends — the direct support that comes from much of the Arab and Muslim world, and the indirect support and encouragement (although of course they would deny it) that is provided by the worldwide demonizers of Israel. Meanwhile, congratulations to the IDF for killing the terrorists and their commanders. This entry was posted on Thursday, August 18th, 2011 at 8:51 am and is filed under General. You can follow any responses to this entry through the RSS 2.0 feed. Both comments and pings are currently closed. You are certainly right. It is the families that will remember this. And for others it will blur into being one part of a long and never- ending list of terror – attacks against Israel. As it is now my pessimistic soul has gotten a hold of me and I cannot begin to imagine how there will be an end to this. There are so many terrorist groups so many terrorists so many terrorist nations so many haters of Israel so many demonizers of Israel for whom the cost of their hate is so small, that this seemingly will go on and on and on. How we can win in all this and limit the damages to our side is a question for those with the real responsibility for this to answer. As it is now I agree with you and Barry Rubin it looks like we are going to something far worse. Egypt is one big possibility here. Hizbollah and Iran are waiting to do their part. The Turks may have their own problems but they certainly would help if they could. Syria seems in no position to do this now and this may effect Hizbollah. The Palestinian Authority forces can too be a disturbance if there is a real outbreak. There can be other bad surprises for us. My prayer is that our Security forces will be able to handle all that will be thrown against us.